This is an all natural stain remover stick which really works on cloth pads! Smells great too - really lemony. INGREDIENTS: It's made with all-natural, biodegradable ingredients of saponified oils of coconut, canola and vegetable oi, litsea cubeba essential oil, lemon essential and enhanced with borax to soften the water and aid the cleaning process. There are no artificial dyes or perfumes, just the fresh, clean scent of natural lemon and the deodorizing power of litsea. Buncha Farmers All Natural Stain Remover works on grass, red wine, ketchup, blood, grease, underarm stains, and so much more. Even the most stubborn stains are washed away. 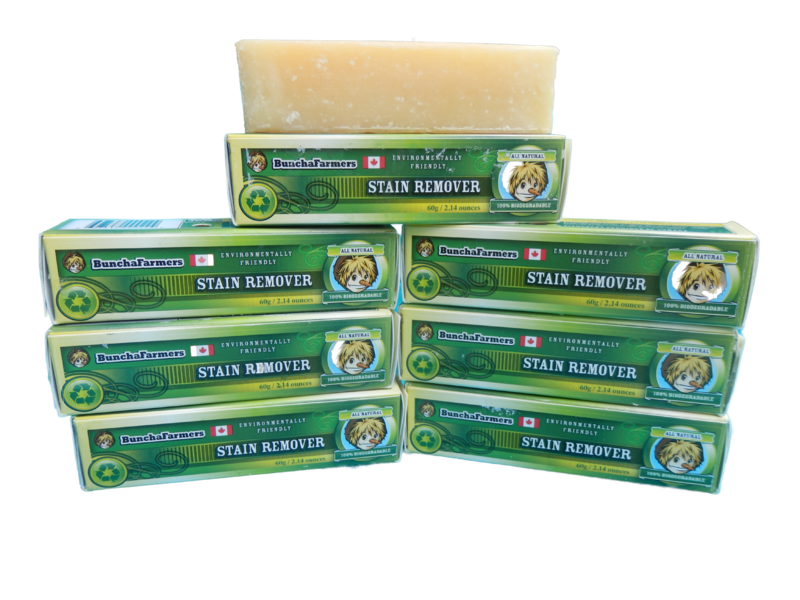 Your favourite blouse, your grandmother's lace tablecloth, your child's car seat, even your walls and carpets - all of them can be treated with All Natural Stain Remover. 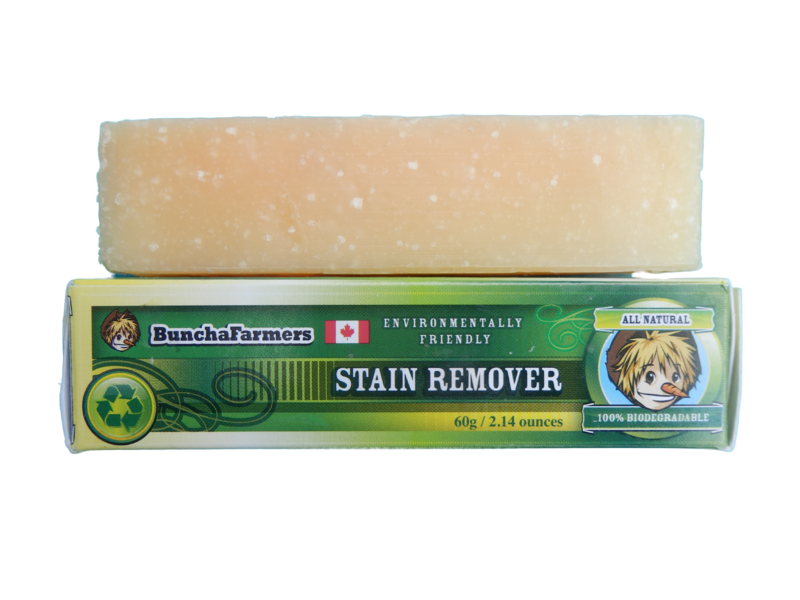 Ordinary stain removers contain chemical detergents, but Buncha Farmers All Natural Stain Remover is real soap. There are no artificial dyes or perfumes, just the fresh, clean scent of natural lemon essential oil and the deodorizing power of litsea. Will not discolour clothes or fabrics. Best of all, it works. If you have a very stubborn stain like blueberry or a baked in stain, you might have to apply the stain remover a couple of times or work at it by hand. it should start to fade and fade until you get it out. TIPS: Cut or scrape off a little of the bar and throw in with your regular wash, it will energize your laundry load. Works Great with Soap Nuts! Clean your shoes or remove the ink of your leather jacket or purse. Melt in Hot water and just spray or rub on carpet surfaces or car seats to get rid of stains and grime. 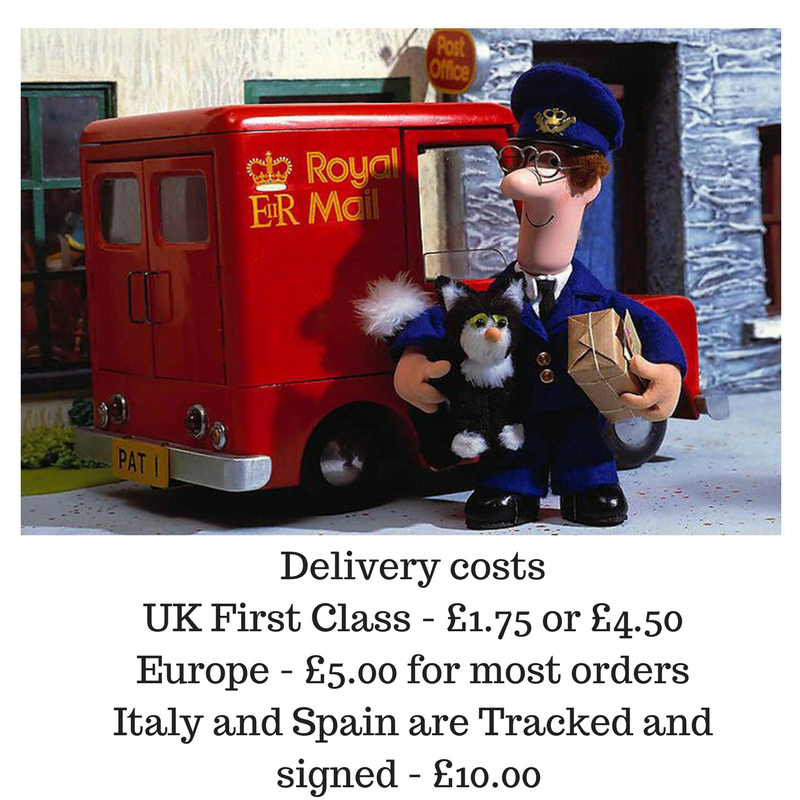 You know the dirt that builds up on your nylon jacket around the cuffs well Presto! it's gone with the natural stain remover. Removes mold from surfaces especially in your fridge. NB. It is always best t o use HOT water when using by hand or prepping for the wash.